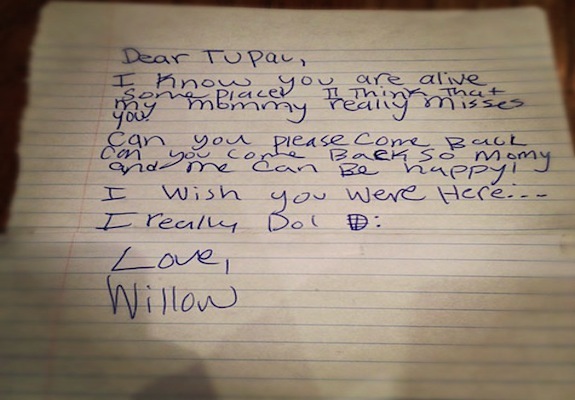 Willow Smith wrote a letter to Tupac Shakur asking him to come back. She wrote it when she was younger and it opens the door to even more speculation and fuel to the search for proof that Tupac may still be alive. You can read the letter for yourself here. I know you are alive someplace. I think that my mommy really misses you. Come back so that my momy and me can be happy! Willow never met Tupac. So, is this just a letter from a little girl that misses him? Or are these the words put together from the information she has been passed down interacting with her mother? Regardless, this letter is interesting, indeed. Productivity Level Up – Now More! Why do they put Fluoride in our Water? Previous post Notorious Big had a parade when he died. Tupac had nothing.